We are coming to the end of the third year of Stitch Tease Bee. It is a great group of friends, most of whom I have met in real life. It's nice to be able to talk about life as well as sewing with this wonderful group and friends. This month, Valerie asked for Jacob's Ladder blocks in pink, yellow, teal and black with the very popular low-volume background (I wonder what the next trend in fabric choices will be). It first sight, these blocks look labor intensive, but in reality they are easily strip pieced and come together easily and quickly. Val, these will be in the mail to you as soon as I get them packed up. You are going to have a beautiful quilt. It's going to be time to re-up again for another year's commitment in the bee. I sure hope everyone says "yes". I've always been a fan of Jacob's Ladder, they look great in these colors. I would never have put this color combo together but I like it! Hope you post her finished quilt. Love them Di! Thank you so much! 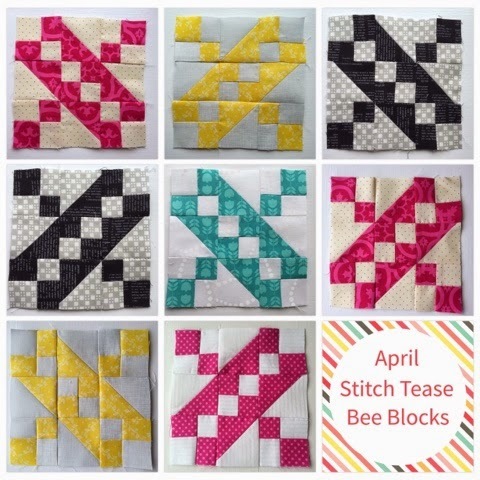 I thought the same thing - these blocks come together quickly with the chain piecing! I am still hoping I did the right thing with the color palette - I debated just white and black or just white and yellow. At the last minute I threw in those other colors and hit send! Sometimes it's hard to know what people have in their stash so I felt like it might be better to have more options.